World's Longest Double Decker Fountain Bridge in South Korea. World’s Longest Double Decker Fountain Bridge in South Korea. 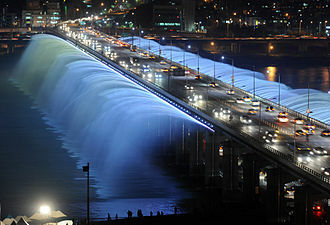 The longest double decker fountain bridge in the world located is in Seoul, South Korea. In 1975, the population increased rapidly in East Asia. The architect in Seoul planned to make second bridge on the existing river Han. The construction was completed within thirty months, in June 1982. Thus, a double deck fountain bridge was made. The upper bridge is called Banpo and the lower part is called Jamsu. In a rainy season, the lower part Jamsu would immerse in the water and public was left at the mercy of the river. The routine crossing suffered heavily; therefore, the decision was taken to make a parallel bridge to overcome the problem. In 2009 the bridge’s uniqueness was recorded in the Guinness Book of World Records. Ten thousand LED bulbs are used to increase the light brightness. The rainbow is made due to the white light to beautify the fountain and the bridge. Thirty-Eight pipes and pumps and seven hundred sixty nozzles are used to give enough pressure for water to fall 20 meters away to give the panoramic beauty effect. One hundred ninety metric tons of water is pumped per minute through the nozzles. The most notable thing is that the lower bridge is used for the walkers and cyclists. Only one lane of car driving is permitted. The upper bridge is used for three lanes each. People gather at each end of the bridge in the evening to enjoy the enormous view. Musical concert is organized daily for people to enjoy and get lost in the “thing of beauty is the joy forever”.